The inimitably brilliant, insightful, and sensitive Daniel Paul Marshall has written a gorgeous review of my new chapbook, The Death’s-Head’s Testament! Please take a look, and consider pre-ordering a copy for just $6.50 each! is: a potential for articulation & loving. Our favorite poet, Robert Okaji, is truly at his finest in this “luminous” collection! Order his must-read chapbook today! Robert Okaji is the best collaborator in the universe — just so you know! 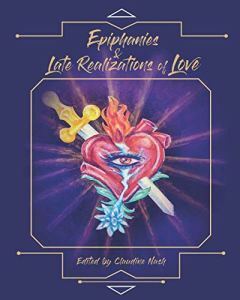 Stephanie L. Harper and I have individual poems and another collaboration inEpiphanies and Late Realizations of Love, aprint anthology of love poems, now available on Amazon. Poem Up at Songs of Eretz Poetry Review! My poem, “Salt,” (just scroll down) is live at the Songs of Eretz Poetry Review, the “love” issue, just in time for Valentine’s Day! Many thanks to editors Steve Gordon and Terri Lynn Cummings for sensitively engaging with and selecting this piece for publication. In I Have a Bird to Whistle, Robert Okaji masterfully constructs a universe of incisively beautiful sensory observations, in which the poet lives at the crux—owns and revels in the “life energy” of the “liminal”—between “unshuttered” stimuli and the “concealed” truth of existence. Here, where every ray of light shed on an otherwise “transitory” moment celebrates the gift of consciousness, and every deviation from expectation substantiates the self-actualizing force of human will, the language of poetry—of colors, sounds, and symbols—circumscribes our very being, as it drives our search for meaning. As nuanced as they are bold and delectable, these poems are utterly human, and utterly divine! – Stephanie L. Harper, author of This Being Done and The Death’s-Head’s Testament. In short, this is a reading experience like no other, that you simply don’t want to miss! U.S. Residents can purchase I Have a Bird to Whistle HERE for the fantastic price of $7.50/copy, shipping included. Non-U.S. purchasers can order directly from Robert by emailing aBirdtoWhistle@yahoo.com.